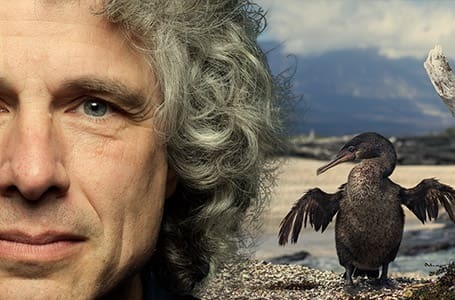 Darwin Finches, or Galapagos Finches, are small land birds with generally dull black, brown or olive, often streaky, plumage; short tails; and short, rounded wings. Their bills vary greatly in size and shape (a fact which was instrumental in inspiring Charles Darwin's thinking in relation to the theory of evolution - and hence the name given to this fascinating group of species). Distinguished by large size and short, broad bill which is deep at the base. ADULT MALE: Head, neck, breast and back black when fully mature, the remainder of the plumage being olive-brown and streaked. Bill pale pinkish or yellowish. FEMALE / IMMATURE: Upperparts brown and streaked with unstreaked olive rump. Underparts pale.